This is a Japanese name; the family name is Nitobe. Nitobe Inazō (新渡戸 稲造, Nitobe Inazō) (September 1, 1862 – October 15, 1933) was a Christian, agricultural economist, author, educator, diplomat, and politician during the Meiji and Taishō periods in Japan. Born the son of a samurai of the Morioka Clan in Iwate, he converted to Christianity while a student at the Sapporo Agricultural College in 1881. In 1884, he went to study in the United States, where he became a Quaker. After earning his doctorate in agricultural economics in Germany, he married Mary Patterson Elkinton in Philadelphia and returned to Japan in 1891 to assume an assistant professorship at the Sapporo Agricultural College. Nitobe served as a professor of law at Kyoto Imperial University and Tokyo Imperial University, Headmaster of the First Higher School (then the preparatory division for the Tokyo Imperial University), and the first president of Tokyo Women's Christian University. He was an Under-Secretary General of the League of Nations from 1919 to 1926, and later chairman of the Japan Council of the Institute of Pacific Relations. Nitobe was a prolific writer and exerted a powerful influence on Japanese intellectuals and students. He was critical of the increasing militarism in Japan during the early 1930s. He wrote many books in English, and is most famous in the West for his work Bushido: The Soul of Japan. Nitobe was born September 1, 1862, in Morioka, Mutsu Province (present-day Iwate Prefecture), the third son of Jujiro Nitobe, a samurai of the Morioka clan and a retainer to the local daimyo of the Nambu clan. His infant name was Inanosuke. Nitobe left Morioka for Tokyo in 1871 to become the heir to his uncle, Ota Tokitoshi, and adopted the name Ota Inazo. He later reverted to Nitobe when his brothers died. In 1881, Nitobe graduated in the second class of the Sapporo Agricultural College (now Hokkaido University). He was converted to Christianity under the strong legacy left by Dr. William S. Clark, a former president of the Massachusetts Agricultural College and the first Vice-Principal of the Sapporo Agricultural College. Dr. Clark, taught in Sapporo for only eight months, but left a deep impact on the student body. His words to the ten or so boys who came to see him off at his departure, "Boys, be ambitious!," have become a famous saying in Japan. Dr. Clark left before Nitobe's class arrived in the second year after the opening of the college, so the two men never personally crossed paths. Among the classmates who converted to Christianity at the same time as Nitobe was Uchimura Kanzo. Nitobe and his friends were baptized by an American Methodist Episcopal missionary, Bishop M.C. Harris. Nitobe's decision to study agriculture was due to a hope expressed by Emperor Meiji that the Nitobe family would continue to advance the field of agricultural development. Nitobe's father had developed former wastelands in the north of the Nambu domain, near present-day Towada, then part of Iwate Prefecture, into productive farmland. In 1883, Nitobe entered Tokyo Imperial University for further studies in English literature and in economics. In 1884, Nitobe traveled to the United States where he stayed for three years, and studied economics and political science at Johns Hopkins University in Baltimore, Maryland. While in Baltimore he became a member of the Religious Society of Friends (Quakers). Through a Quaker community in Philadelphia he met Mary Patterson Elkinton, whom he eventually married. While at Johns Hopkins, he was granted an assistant professorship at the Sapporo Agricultural College, but was ordered to first obtain his doctorate in agricultural economics in Germany. He completed his degree after three years in Halle University and returned briefly to the United States to marry Mary Elkinton in Philadelphia, before assuming his teaching position in Sapporo in 1891. By the time he returned to Japan, he had published books in English and in German, and had received the first of his five doctorate degrees. In 1901, Nitobe was appointed technical advisor to the Japanese colonial government in Taiwan, where he headed the Sugar Bureau. Nitobe was appointed a full professor of law at the Kyoto Imperial University in 1904 and lectured on colonial administration policies. He became the Headmaster of the First Higher School (then the preparatory division for the Tokyo Imperial University) in 1906 and continued this position until he accepted the full-time professorship on the Law Faculty of Tokyo Imperial University in 1913. He taught agricultural economics and colonial policy, and emphasized the humanitarian aspect of colonial administration. During his tenure as president at the First Higher School, he implemented education based on the principles of personalism. Nitobe attempted to compensate for Japan’s late start in the education of women by supporting the establishment of Tokyo Woman's Christian University (Tokyo Joshi Dai), becoming its first president in 1918. His students at Tokyo Imperial University included Tadao Yanaihara, Shigeru Nanbara, Yasaka Takagi, and Tamon Maeda. (Yanaihara later continued Nitobe's chair in colonial studies at Tokyo University; but Yanaihara's pacifist views and emphasis on indigenous self-determination, which he partly inherited from Nitobe, came into a full conflict with Japan's wartime government during World War II, and he was barred from teaching until after the war). In 1911, Nitobe and Hamilton Wright Mabie became the first exchange professors between Japan and the United States, under the auspices of the Carnegie Endowment for International Peace. Bushido: The Soul of Japan is, along with the classic text Hagakure by Tsunetomo Yamamoto, a study of the way of the samurai. A best-seller in its day, it was read by many influential foreigners, among them President Theodore Roosevelt, President John F. Kennedy and Robert Baden-Powell. Possibly, it shaped Baden-Powell's vision for the Boy Scout movement. Nitobe originally wrote Bushido: The Soul of Japan in English. As Japan underwent deep transformations of its traditional lifestyle while forging into a modern nation, Nitobe engaged in an inquiry into the ethos of his nation. He found in bushido, the Way of the Warrior, the source of the virtues most admired by his people: rectitude, courage, benevolence, politeness, sincerity, honor, loyalty and self-control. His approach to his task was eclectic and far-reaching. Nitobe delved into the other indigenous traditions of Japan, such as Buddhism, Shintoism, Confucianism, and the moral guidelines handed down over hundreds of years by Japan's samurai and sages. He sought similarities and contrasts with Western philosophers and statesmen, and the antecedents of European and American thought and civilization. Delving into Ancient Rome, Hellenistic Greece and Biblical times, he found a close resemblance between the samurai ethos of what he called “bushido” and the spirit of medieval chivalry and the ethos of ancient Greece, as expressed in books like the Iliad of Homer. When the League of Nations was established in 1920, Nitobe became one of the Under-Secretaries General of the League, and moved to Geneva, Switzerland. He served as a founding director of the International Committee on Intellectual Cooperation (which later became UNESCO under the United Nations' mandate). His legacy from this period includes the settlement of a territorial dispute between Sweden and Finland over the Swedish-speaking Åland Islands. The Islands remained under the Finnish control, but were disarmed and granted autonomy, averting a possible armed conflict (See also Åland crisis). In August 1921, Nitobe took part in the 13th World Congress of Esperanto in Prague, as the official delegate of the League of Nations. His report to the General Assembly of the League was the first objective report on Esperanto by a high-ranking official representative of an intergovernmental organization. Although the proposal for the League to accept Esperanto as their working language was accepted by ten delegates, the French delegate used his veto power to block the issue. In 1927, after his retirement from the League of Nations, Nitobe briefly served in the House of Peers. He was critical of the increasing militarism in Japan during the early 1930s, and was devastated by Japan's withdrawal from the League of Nations in 1933 over the Manchurian Crisis and the Lytton Report. Nitobe died in Victoria, British Columbia, Canada in October, 1933, on his way home from an international conference in Banff, Alberta. Morioka, Nitobe's birth place, and Victoria have been twin cities since 1985. Mary Elkinton Nitobe lived in Japan until her death in 1938. Mary compiled and edited many of Nitobe's unpublished manuscripts, including his memoirs of early childhood, and contributed greatly to the preservation of his writings. Nitobe Inazo was a prolific writer, who published many scholarly books as well as books for general readers (see below), and contributed hundreds of articles to popular magazines and newspapers. A fine stylist in English, he wrote many books in that language, which earned him a place among the best known Japanese writers of his age. Nitobe is perhaps most famous in the West for his work Bushido: The Soul of Japan (1900), which was one of the first major works on samurai ethics written directly in English for Western readers. (The book was subsequently translated into Japanese.) Although sometimes criticized for portraying the samurai in terms so Western as to lose some of their actual meaning, the book was a pioneering work of its genre. Nitobe's writings are now available in Nitobe Inazo Zenshu (the Complete Works of Inazo Nitobe), a 24-volume set published by Kyobunkan, 1983-1991. His English and other Western-language works are collected in the five-volume Works of Inazo Nitobe, The University of Tokyo Press, 1972. Major critical essays on Nitobe's life and thought were collected in Nitobe Inazo: Japan's Bridge Across the Pacific (John F. Howes, ed., Westview, 1995). 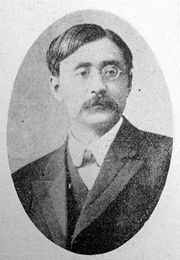 George M. Oshiro published Nitobe’s full biography in English as Internationalist in Pre-War Japan: Nitobe Inazo, 1862-1933 (UBC PhD. Thesis, 1986); and in Japanese as Nitobe Inazo, Kokusai-shugi no Kaitakusha (Chūō Daigaku Shuppanbu, 1992). His portrait was featured on the series D of ¥5000 banknote, printed from 1984 to 2004. 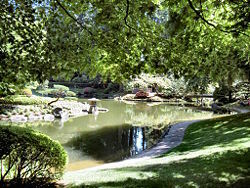 The Nitobe Memorial Garden is a traditional Japanese garden located at the University of British Columbia in the University Endowment Lands, just outside the city limits of Vancouver, Canada. It is part of the UBC Botanical Garden and Centre for Plant Research. One of the most authentic Japanese Tea and Stroll Gardens in North America, it honors Inazo Nitobe, whose goal was "to become a bridge across the Pacific." The garden includes a rare, authentic Tea Garden with a ceremonial Tea House. Each tree, stone and shrub has been deliberately placed and is carefully maintained to reflect an idealized conception and symbolic representation of nature. There is harmony among natural forms—waterfalls, rivers, forests, islands and seas—and a balance of masculine and feminine forces traditionally attributed to natural elements. The garden's creators incorporated many native Canadian trees and shrubs could be trained and pruned in typical Japanese fashion; maple and cherry trees and most of the azaleas and iris were brought from Japan. A UBC professor, who has studied the garden for over fifteen years, believes that its construction hides a number of impressive features, including references to Japanese philosophy and mythology, shadow bridges visible only at certain times of year, and positioning of a lantern that is filled with light at the exact date and time of Nitobe's death each year. "What is important is to try to develop insights and wisdom rather than mere knowledge, respect someone's character rather than his learning, and nurture men of character rather than mere talents." "If there is anything to do, there is certainly a best way to do it, and the best way is both the most economical and the most graceful." “Let it be far from me to turn Quakerism into Oriental mysticism. Quakerism stays within the family of Christianity. ... Unlike Orientals, George Fox and his followers conceived ... of light as a person, but by making their person eternal and existent before the world was, Quakerism came to much the same conclusion as the old mystics…. 1972. The works of Inazo Nitobe. Tokyo: University of Tokyo Press. 1912. The Japanese nation; its land, its people, and its life, with special consideration to its relations with the United States. New York: G.P. Putnam's Sons. ↑ For a Quaker View of Nitobe, see Tadanobu Suzuki, Bridge across the Pacific: the life of Inazo Nitobe, friend of justice and peace (Argenta, B.C. : Argenta Friends Press, 1994 (Canadian Quaker pamphlets; 41), ISBN 0920367364). ↑ "Esperanto and the Language Question at the League of Nations" Retrieved May 16, 2008. Elkinton, David Cope. The Elkintons and Inazo Nitobe. Morioka, Japan: Inazo Nitobe Foundation, 2002. Kitasawa, Sukeo. The life of Dr. Nitobe. Tokyo: Hokuseido Press, 1953. Thorne, Dorothy Lloyd Gilbert, and J. Passmore Elkinton. Inazo and Mary P.E. Nitobe. Swarthmore, PA: J. Passmore Elkinton, 1955. This page was last modified on 5 December 2018, at 15:40.